Taurus Model 85, 38 special revolver. Snubbies and handgun accessories are hot commodities in gun shops around the country. This recent winter, Roger Howe, owner of L&R Arms Exchange, has been selling a large number of handguns for concealed carry customers. But whereas the in-demand handguns in 2014 were .380 semi-autos, now his customers are much more interested in buying “snubbies,” or snub-nosed revolvers. Leading the pack here are Taurus Model 85’s in .38 Special and various Rossi revolvers in .38 Special, as well as .357 Mag. 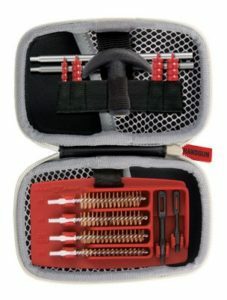 The Real Avid Gun Boss Handgun Cleaning Kit is one of the more popular handgun accessories with Gun Digest readers. Click here to check it out. With a customer base extremely interested in self-defense and concealed carry, it is no wonder that Center Target Sports in Post Falls, Idaho, sells a steady stream of handgun accessories. Owner Edward Santos says mini red-dot optics for pistols are increasingly popular with his customers, especially the Trijicon RMR at $349.99 and the Burris Fast Fire priced a little less at $269.99. Center Target could not keep the 9mm Beretta Nano in stock when the small carry pistol first came out. Now, the demand in this segment of the concealed carry market has shifted to the Glock 42 and Sig P238, while Smith & Wesson J-Frame revolvers are doing very well here, too. This article appeared in the May 2015 issue of Gun Digest the Magazine. Click here to download the issue.